South Korean President Moon Jae-in and Russian President Vladimir Putin agreed Friday to work to launch negotiations for a free trade agreement between their countries. In a summit held in Moscow, the leaders agreed to initiate “local processes” to allow the start of FTA talks, Moon’s presidential office Cheong Wa Dae said in a press release. “To achieve the goal of $30 billion in trade and 1 million in the number of visitors between the two countries by 2020, the two leaders agreed to work for practical cooperation that can actually benefit the people of the two countries,” it said. “In particular, the two leaders agreed to start local processes for the launch of FTA negotiations between South Korea and Russia in the service and investment sectors first,” the press release said. A memorandum of understanding was signed later on joints efforts to launch FTA negotiations, along with 11 other agreements that call for bilateral cooperation and exchange in various areas, including information and communication technology, railways and natural gas. The Moon-Putin summit, the third of its kind, also focused on ways to peacefully denuclearize North Korea as it followed Moon’s two historic summits with North Korean leader Kim Jong-un on April 27 and May 26. “We two leaders have closely cooperated while sharing the common goal of complete denuclearization of the Korean Peninsula and establishment of permanent peace,” Moon said at the start of his bilateral summit with the Russian president, according to Cheong Wa Dae pool reports. “I express my deep gratitude in that Russia has actively supported the progress in conditions on the Korean Peninsula such as the successful South-North Korea summit and the North Korea-US summit. I will continue to closely consult with the Russian government and work with it to completely and swiftly implement the outcome of the South-North Korean summit and the North Korea-US summit,” Moon added. The North Korean leader promised to completely denuclearize the Korean Peninsula in the two inter-Korean summits. He again affirmed his commitment to denuclearization in his meeting with US President Donald Trump held in Singapore last week. Putin vowed to continue supporting the denuclearization process, saying he and his country have always supported dialogue between the leaders of the two Koreas, the pool reports said. Both Moon and Putin stressed the importance of cooperation between their countries. 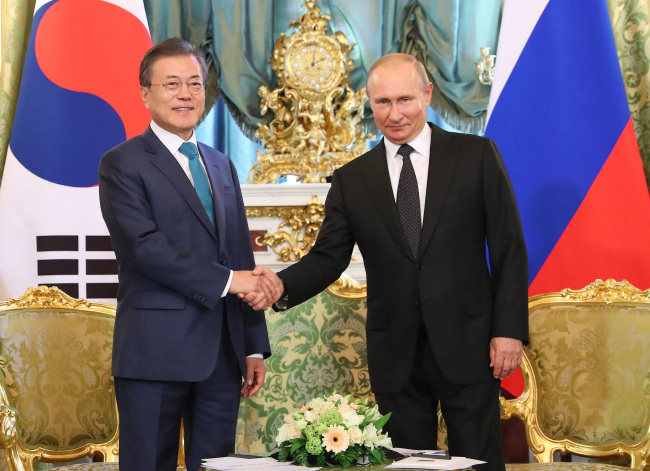 “I believe South Korea and Russia are key cooperation partners on the Korean Peninsula and the Eurasian continent and therefore place great importance on strategic cooperation with Russia as an important part of our government’s foreign and security policies,” Moon was quoted as saying. Putin expressed hope for increased economic cooperation, noting the countries’ bilateral trade volume has reached nearly $20 billion but has room for further growth. The leaders were later joined by other members of their governments for an expanded summit. In a joint press conference following their summit, Moon said the agreements reached at the summit will help improve the lives of people in both countries. “We already have a common policy direction. That is to improve the lives of the people. We have agreed to more actively push for cooperation between the two countries that will benefit the people,” Moon said. To this end, the countries will expand their information and communication technology cooperation while also working to ensure peace and joint prosperity through economic cooperation, he added. Also, Seoul will expand its medical and welfare support for Russia, with a South Korean general hospital already set to be opened in Skolkovo, Moon said. The Russian president has officially invited Moon to take part in the Eastern Economic Forum to be held in Vladivostok in September to further discuss ways to increase the countries’ bilateral cooperation, Cheong Wa Dae spokesman Kim Eui-kyeom told reporters. Moon took part in the annual regional forum last year, unveiling his New Northern Policy that seeks to greatly improve South Korea’s ties and economic cooperation with Russia and other Asian countries. Moon has agreed to consider taking part in the regional forum and decide in the near future, according to his spokesman. If he does take part, it may set him up for a third meeting with North Korean leader Kim, who has already been invited to the annual forum, according to earlier reports. 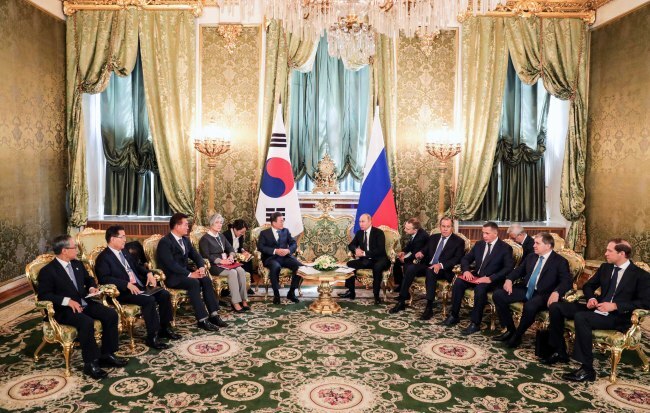 Moon too asked his Russian counterpart to visit South Korea, partly to reciprocate his trip to Moscow, according to a joint statement issued by the leaders at the end of their summit. Putin accepted the invitation, with the exact date of his trip to be decided later, the joint statement said.